I'm an experienced gardener, and love sharing tips and tricks for making your garden the best it can be. My husband finally got the time to put up my bottle tree. I have planted morning glories so they can grow up the tree. They grew up the tree but didn't bloom very well. A clematis planted by the tree worked out well. It grew up between the bottles. Diane Speros contacted me from Harris Publications. The magazine is going to put my bottle tree photo, with the clematis, in their publication of Flea Market Outdoor 2016. We have people drive by here and they slow down and keep looking in our yard. My husband and son were wondering what in the world they found so interesting. A red truck stopped the other day and our son went out and motioned for them to come into the driveway. He wanted them to come in and tell us what they were looking at. We're friendly we don't mind. They wouldn't come in. I told the men in my family they were looking at my beautiful bottle tree. They just laughed. My personal belief is bottle trees came here by Europeans. My family goes back to the first settlers. They came with many superstitions. They believed in witch balls and gazing balls and also hung bottles in the trees to catch evil spirits. There are photos of other trees in this hub. 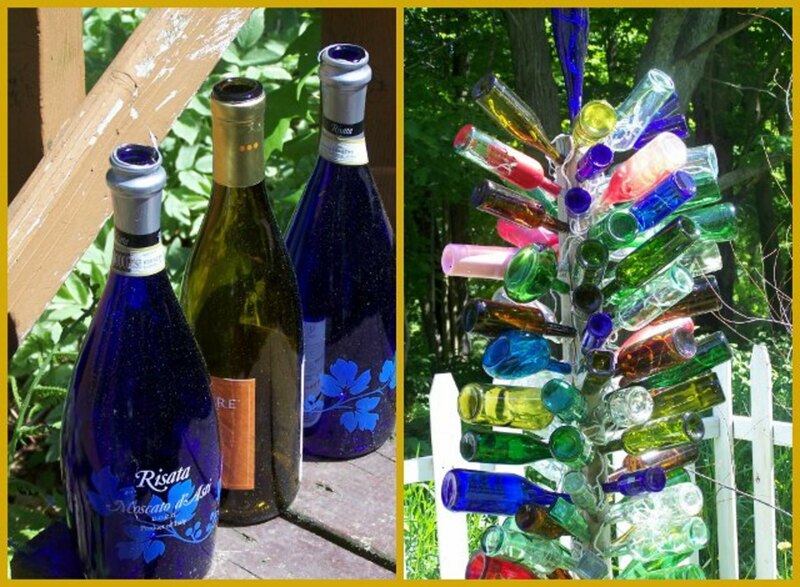 Each one has its own charm and gives everyone ideas on how to do their bottle tree. 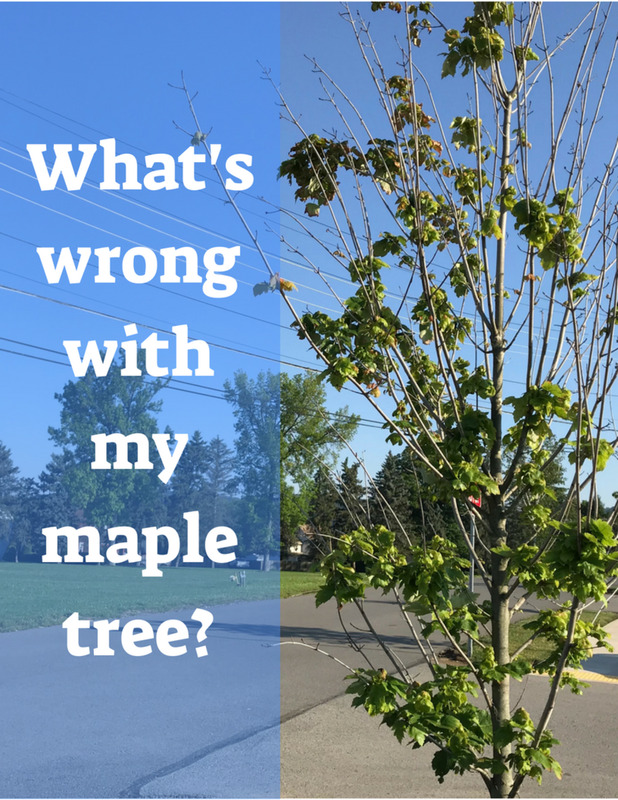 Many people make their trees from metal rods, or simply place the bottles on old dead trees in their yard, but that wasn't the kind I wanted. It's up to you to decide what kind of tree you want, and the functionality will stay the same no matter which way you choose. I love the bottle tree on the right in the entrance so pretty. There is no reason you can't put one in your home. A small one by the window to catch the evil before it enters. In Texas, blue bottle trees are called bluebonnet bottle trees. I think this is a very pretty blue tree. Bud Light Platinum now has blue bottles, they can be used on a tree. 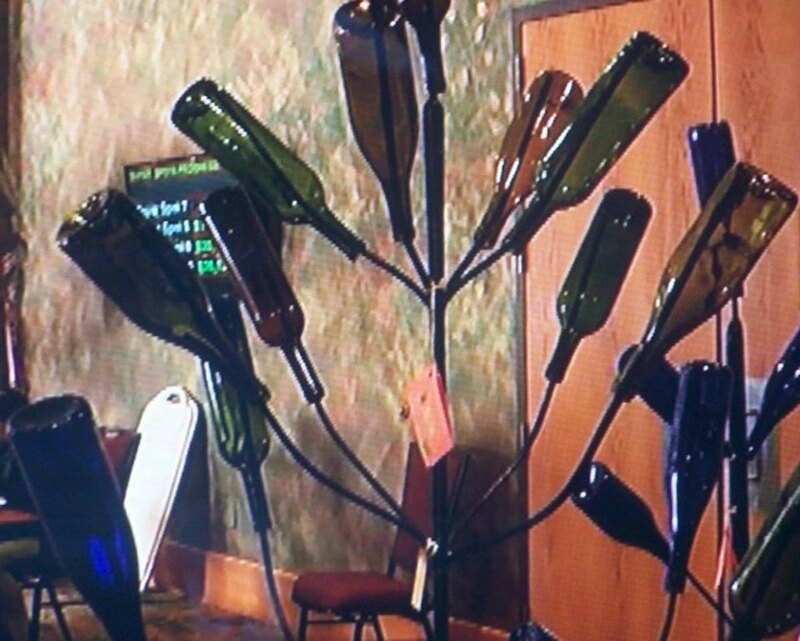 A bottle tree would brighten up the cold winter garden and you can add twinkle lights, how pretty would this be? You can make a tiny little tree with cobalt blue bottles. We plan to have lots more bottles than what you see in the last picture. I want it to look full like the second photo in this hub. We put lights on the tree for Christmas. A man in our town makes bottle trees. I'm very surprised to see a Northern making bottle trees it's usually someone from the south. I can drive all over town and not find a tree. I went looking for one the other day someone said they had seen and never did find it. If you don't want to make your own you can always check out Jerry Swanson's Bottle Tree site and see if you like any of his trees to buy. I don't know the man so I can't tell you much about buying his trees. Just another avenue you can use if you don't want to make your own tree. We finally got started on the bottle tree. We used a treated post from Home Depot. The post is 3x5. My hubby nailed large spikes into the post. He used 80 D hot dip galvanized pole barn nails. They glisten in the sun and howl in the wind. A bottle tree brightens up any cold winter garden, especially with twinkle lights. How pretty would that be? The clematis I planted by my tree has grown up between the bottles and looks beautiful. I have wanted a bottle tree for my garden for a long time, and my husband finally got the time to put one up. I love this form of old, Southern garden art that glistens in the sun and howls in the wind. Bottle trees are also great because they require no care. 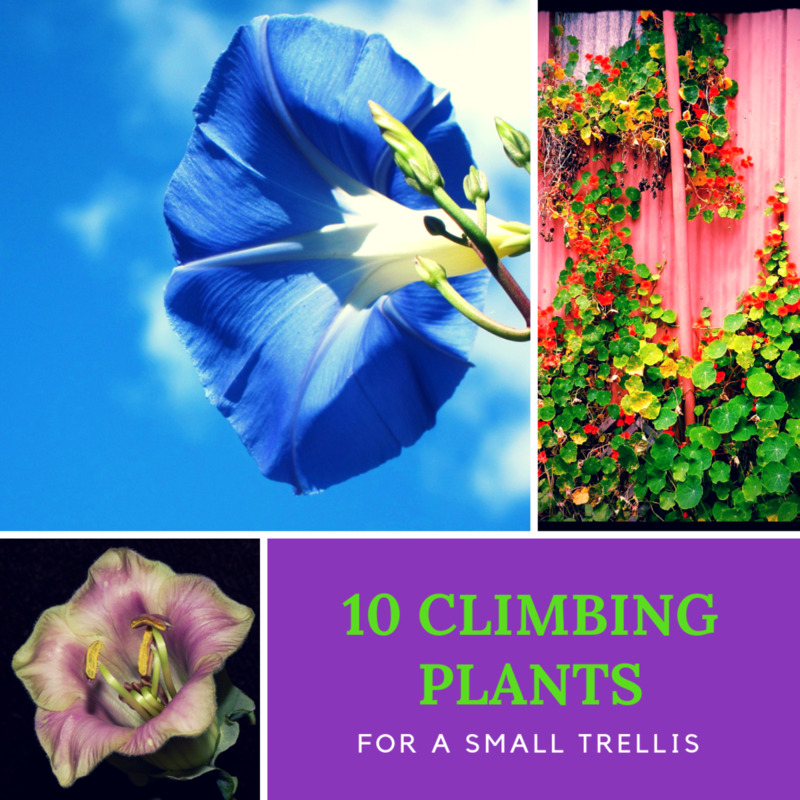 Once they're up, you never have to water them, and you don't have to worry about them getting too hot or cold. You can even decorate them during the holidays! 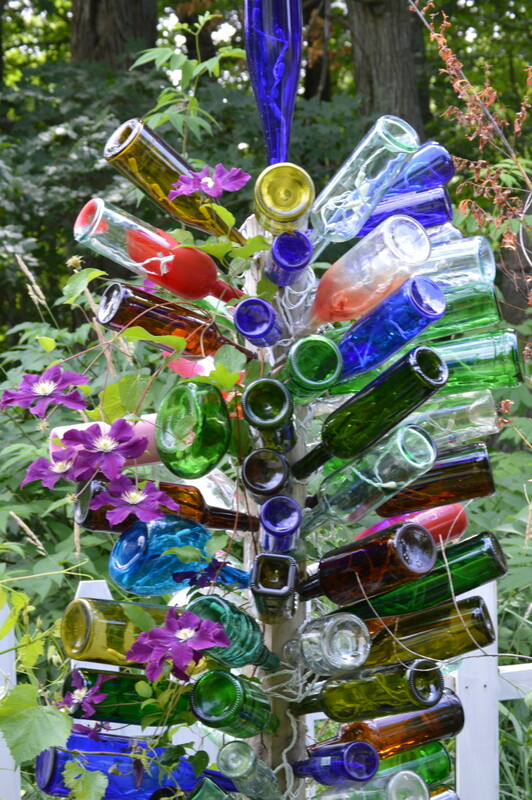 This article will show you how to make a bottle tree for your garden. 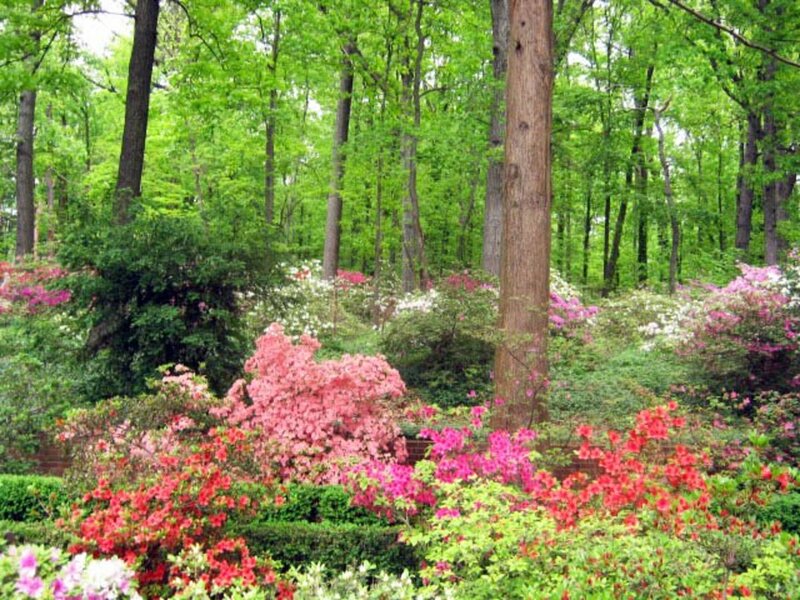 It's not hard, and it looks beautiful, especially once your garden starts to grow around it. 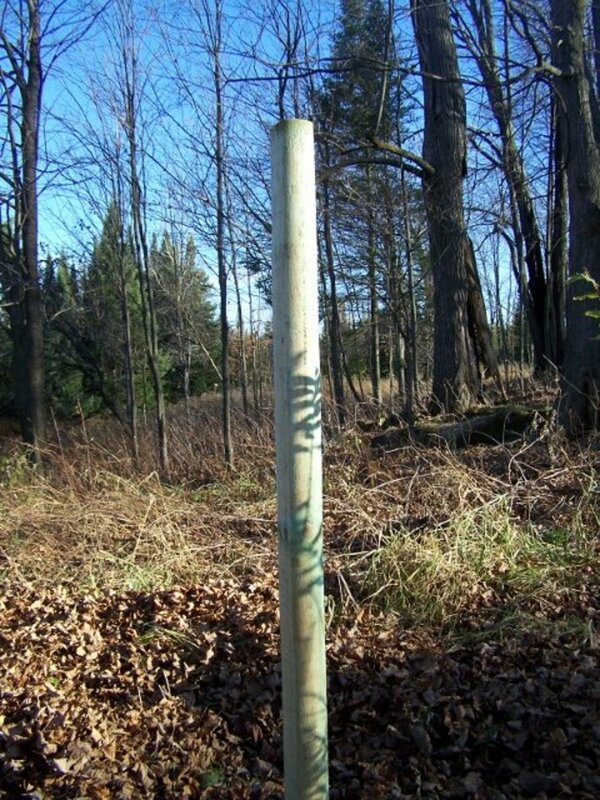 I would rather have used a tree stump, but even in our woods, we couldn't find one that worked. 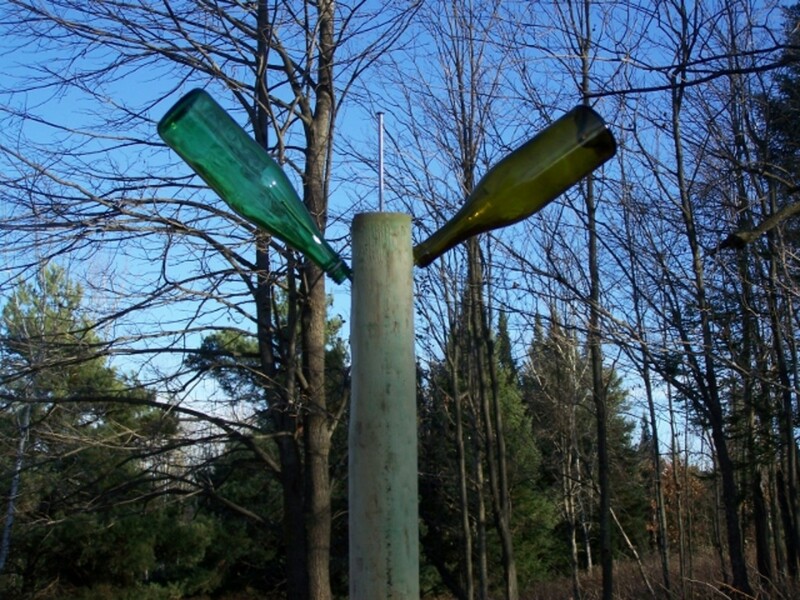 No matter what your situation, there's a way to make a bottle tree work for you. Dig a hole about 25 inches deep and about 12 to 14 inches around. Drill holes at an angle to put your spikes in. 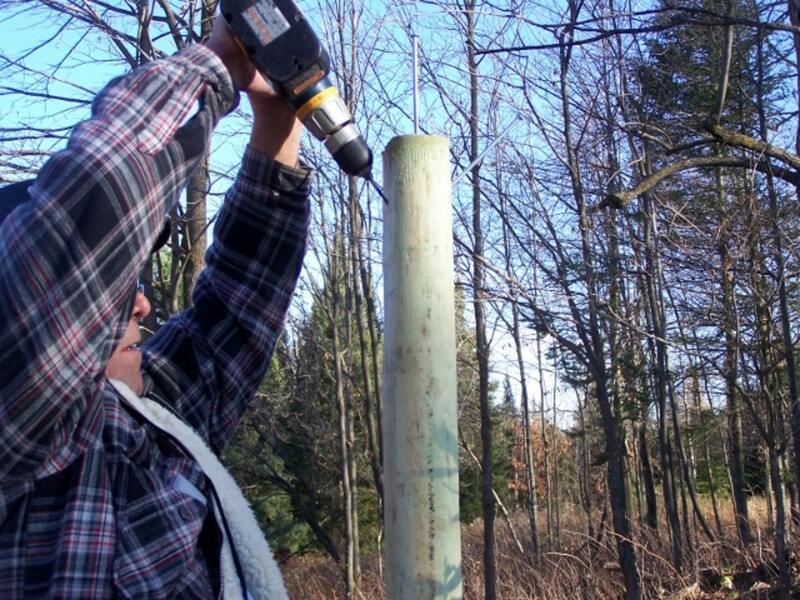 Remember to drill the holes far enough apart so each bottle will fit and have room for the next bottle. Use a hammer (or drill if you're using screws) to make sure spikes are secure. Decorate your tree with bottles! 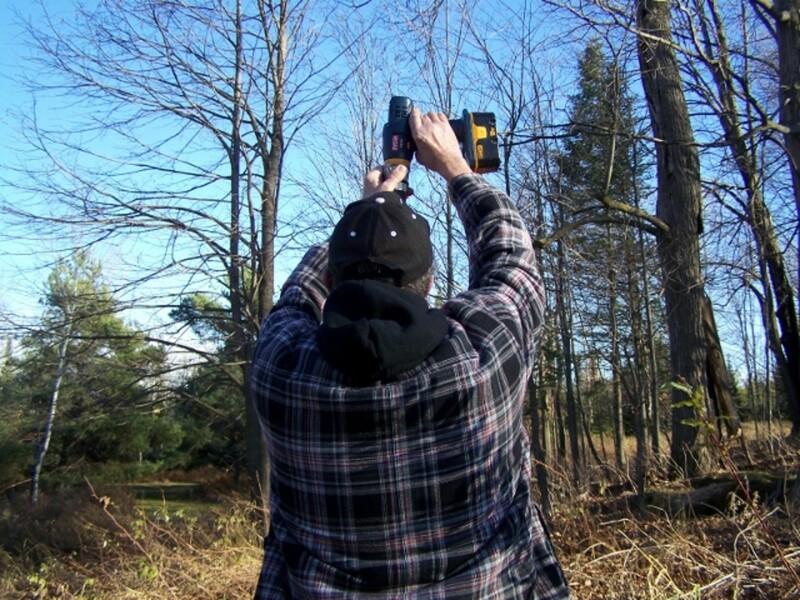 Below are a video and step-by-step photos of my husband putting up our bottle tree. Steps 1 and 2: Dig a hole, and place your post inside. You can either use dirt or concrete to fill the hold back in around the post. Step 3: Begin drilling screws into your post. Step 4: Hammer/drill in any loose nails/screws. 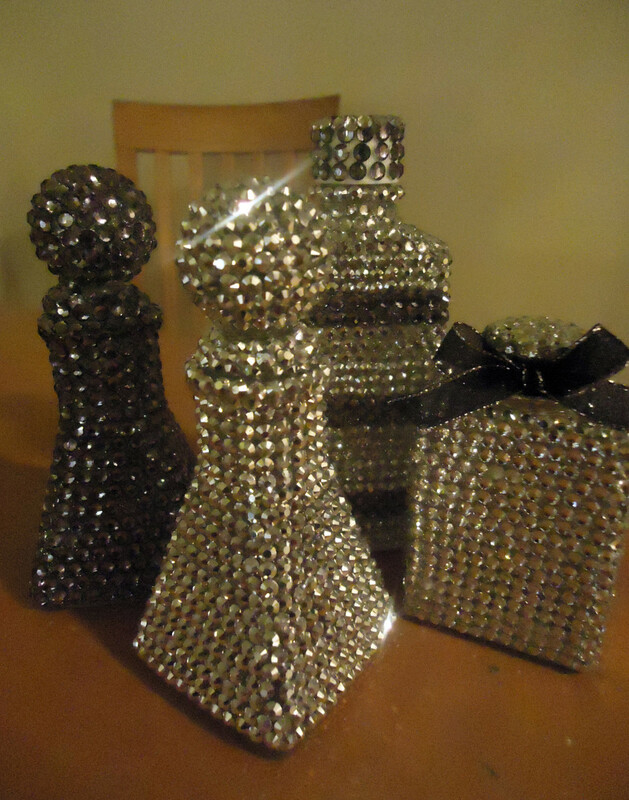 Step 5: Decorate with bottles! While you can buy bottles on the Internet, I prefer collecting them. I've even hit the liquor store looking to see if I can find a different or special one. 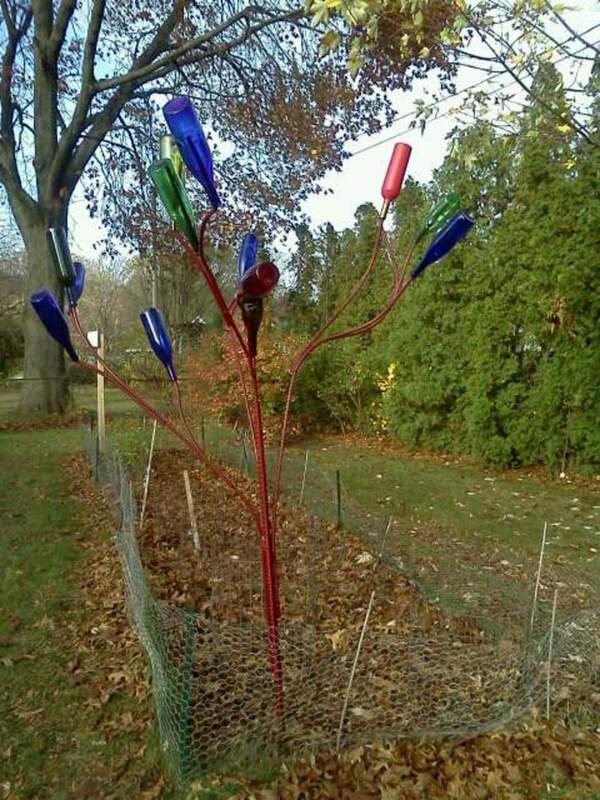 You can also tell people you are putting up a bottle tree; you will be surprised at how many bottles you get. At first, I had trouble getting the ones I needed, but now that people know I want them, I'm getting them pretty fast. They may look at you like you're crazy—my children certainly did—but it's worth it. Some bottles look nice and pretty, but when they are put on the tree, the plastic coating will start to come off. I leave them on anyway, because at least I will end up with nice, clear glass. Go in antique stores, rummage sales, and flea markets to find them. The bottles here are from my collection of blue. One is a wine bottle, another is an old seltzer bottle, and the rest are shot glasses. A bottle tree decorated entirely with small shot glasses would be pretty. You just have to make the rods they hang on larger or figure out another way to connect them, maybe with wire. Bottles should always be placed upside down, with the neck of the bottle facing the trunk of the tree. If you're putting your bottles on a tree, soak them first to remove all labels. Place the bottle in hot water. Leave to soak (sometimes as long as overnight). Note: There are some labels you have to work at to get off. In this case, I peel as much as I can off, and then let the bottle soak longer. I also use lubricant spray to remove particularly tricky labels, which works well. My bottle tree. These three will be added soon. According to legend, evil spirits looking for trouble are attracted to the bright, beautiful colors. These spirits will go in the bottles and become trapped. The sun will then burn up the evil spirits in the morning. Just think how many terrible spirits they will catch on Halloween night. The bottles will also keep spirits from entering your home. Blue bottles are for health, and they catch the evil spirits spreading sickness. When the wind blows, you may just hear the moan of the evil spirits. Bottle trees are also called "haint" trees, haint meaning ghost. Some say they originally came from Europe, where people used them in their gardens and yards to keep evil spirits away. Others say they were brought to America from Africa by slaves. Whatever the true story might be, bottle trees have been in Southern gardens for a very long time. Hang a jar in a tree and add colored water. 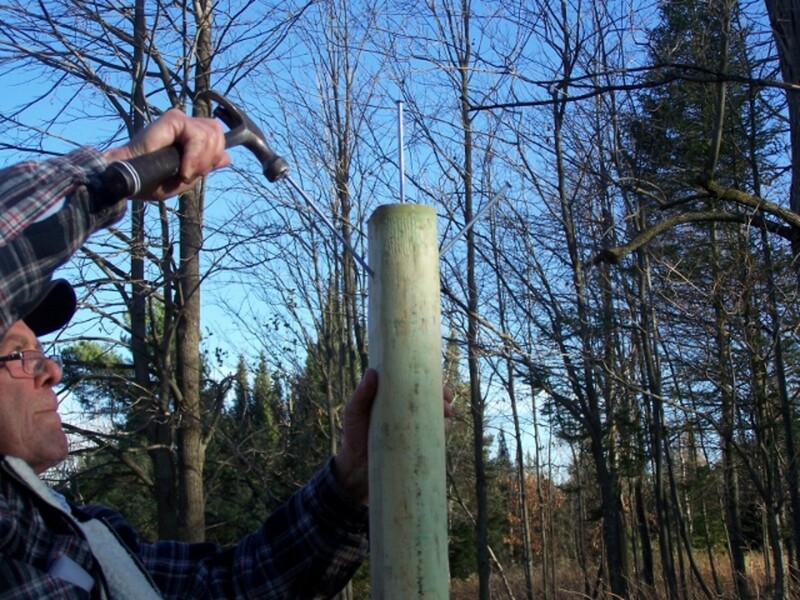 Place a series of metal rods in the ground, and place a single bottle on each. Place bottles directly onto old trees in your yard. Buy a witch ball. These were hung in cottage windows in 18th century England to ward off evil spirits and come in many pretty colors. All of these options are said to capture evil spirits, so pick whichever one suits you best. I love decorating my bottle tree for the holidays. They really brighten up a cold, winter garden! Putting icicle lights inside each bottle works particularly well. Even with white lights, your tree will still be colorful. Our bottle tree during Halloween. My aunt has wanted a bottle tree for a long time, so her children found a welder and commissioned this one for her backyard. 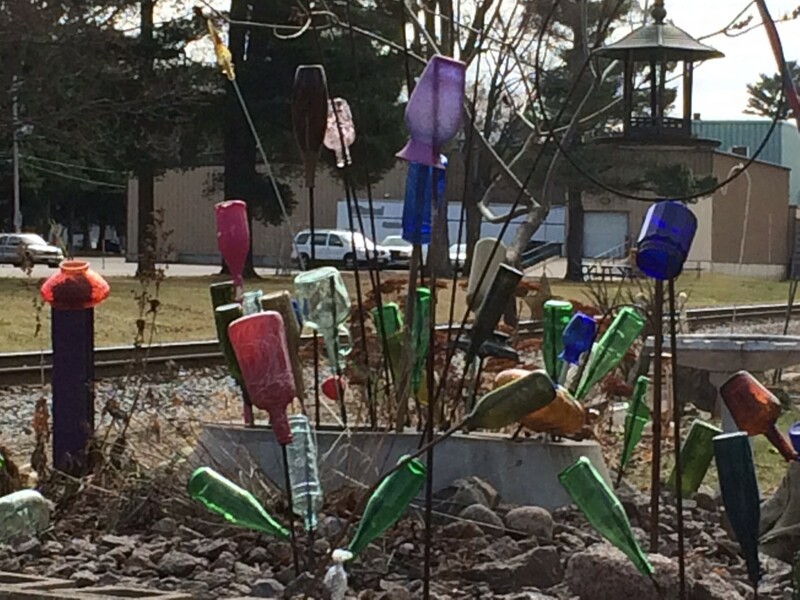 They live in Michigan and said they are seeing more bottle trees around the city every day. More of them are showing up around our town as well. I love all the blue in the second tree below. The bootle trees below are photos I took around town. Bonus: Bottle trees are even showing up in movies! One can be seen in the movies Ghosts of Mississippi (1996) and Wanderlust (2012). A small bottle tree with mixed colors. 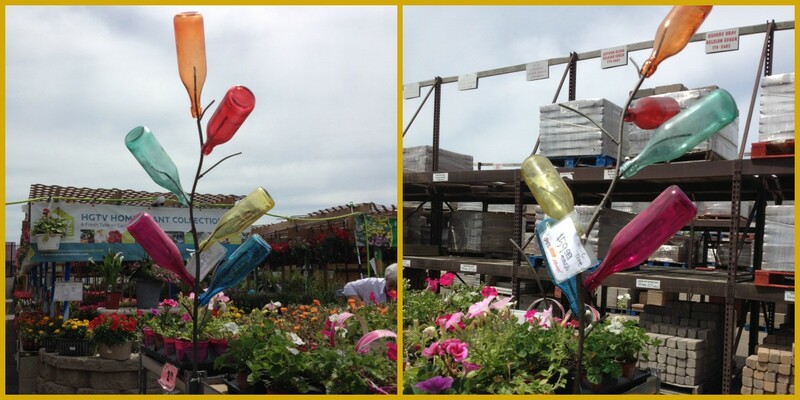 The top photo below is taken of bottle trees in Menards, the price $59.95. I think this is a ridiculous price. 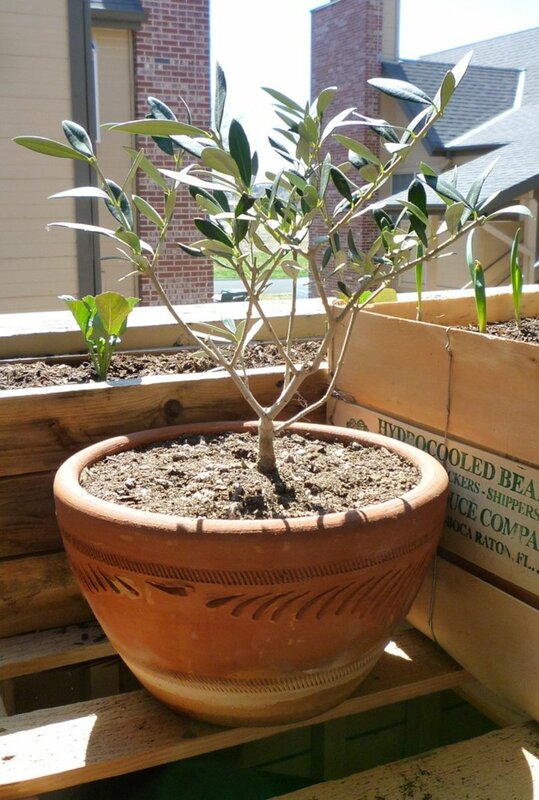 A similar tree can be bought online for about $20.00 to $30.00. You can even get them with solar lights in them. People also sell them at garden shows. Many places either sell or have named their companies after the bottle tree, such as Elmer Long's Bottle Tree Ranch on route 66 in Barstow, California, or The Bottle Tree Beer Company in North Carolina. Ever since my husband put up our bottle tree, we've had people drive by and slow down to look in our yard. My husband and son were wondering what in the world they found so interesting. I told them they were looking at my beautiful bottle tree. They just laughed, but I know it's true. 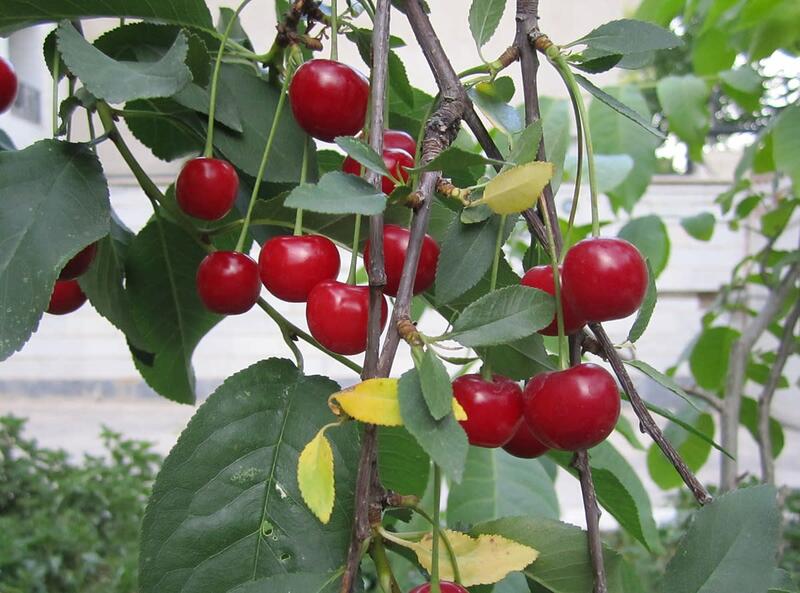 These trees are eye-catching and special, and will make your garden stand out. Each bottle tree has its own charm. I hope this article has given you ideas on how to create yours. Selling Bottle Trees At Garden Shows. 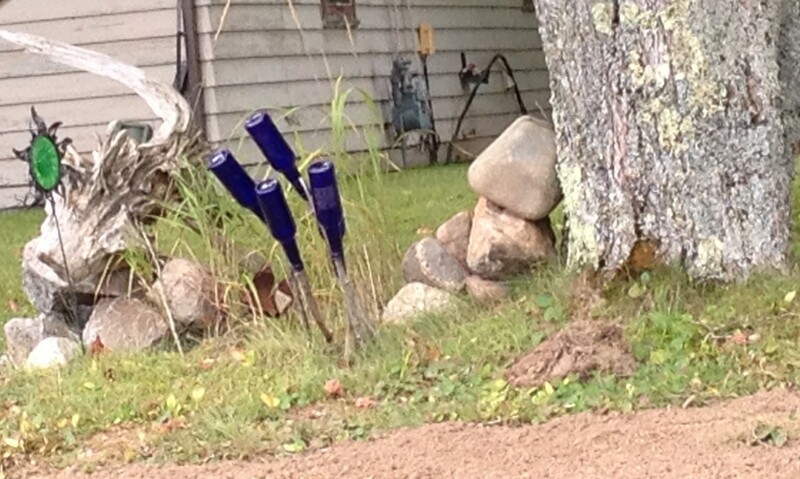 People are now selling bottle trees at garden shows such as the Lakeland Garderners show in Lac Du Flambeau. You have made beautiful bottle trees, no wonder a lot of people come to drop by. I think I want to make one at home, not for evil repellent but for decorative purpose. Thank you for sharing the idea about bottle tree. I have 7 different versions of bottle trees in my yard. I love them. 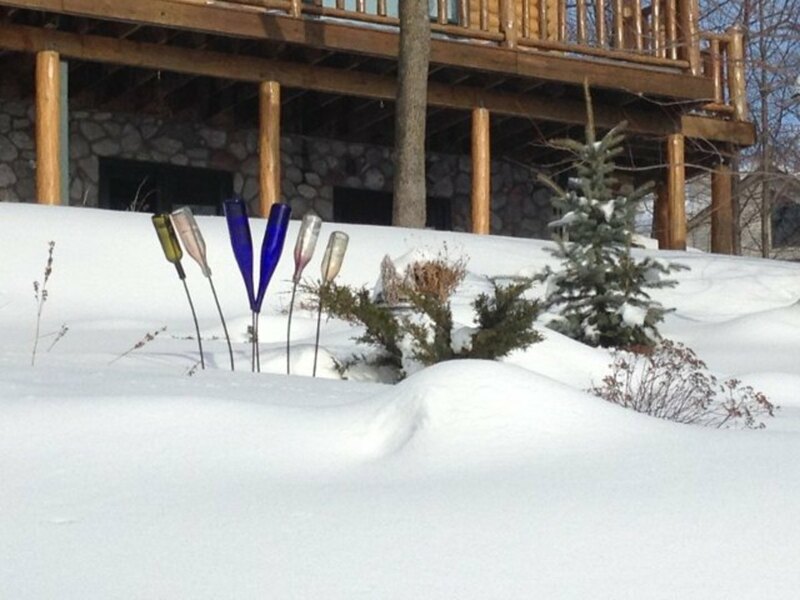 Have even had a couple neighbors put in bottle trees. They are addicting. Irdl3535, Thanks for stopping by and reading my hub. Glad it was informative. I live about 20 minutes from the bottle tree ranch near Victorville. I have always wondered why someone would build a bottle tree. Your post gives me a lot of answers that I never thought of before. It's a great post with lots of information. Thank you, Lowell. I will be moving and will miss my bottle tree moving away. I've never seen a Bottle Tree. I like the dedication you put into this page. I have not heard about the bottle tree and how it is made. I love the whole idea. This looks beautiful and very creative. In addition , if it helps to ward off negative energy or evil spirits as you have mentioned, I am definitely going to make one . Thanks for sharing this very interesting and creative hub! crazyhorsesghost, Thank you for stopping by it's only taken me 6 months to answer your comment. That's nice that you look at your tree right outside your window. I love my bottle tree. starstream, Thank you for stopping by. Thank you for your nice comment. I have one just outside my living room window where I can see it. I really enjoyed your Hub Page here. Voted it up and shared. Great work here. This is an awesome hub full of creative ways to use those beautiful colored glass bottles which so many of us toss to recycle bins. I never had seen these bottle trees before. Thank you for sharing all of the photos! The history of the craft is much older than one would think it to be. OhMe, thank you glad you liked it. I love Bottle Trees and sure enjoyed seeing all your photos. One of these days I will have one, too. Jeannie, Thanks for your great story you must have had a wonderful grandmother. It's nice that they are popping up all over. Virginia Ann, How lucky to get bottles like that. I don't take my bottles off in the winter, none have ever froze. Thanks so much for stopping by and leaving a comment. I started a bottle tree a couple years ago. I live in New England and so far I've been taking the bottles off the tree in the winter time. If any moisture would get inside the bottle I'm afraid it would freeze and break the bottle. My daughter works in a Bowling Alley with a lounge and when bottles are empty they send them to me. I got the idea from a friends daughter in Florida that had one in her back yard along a canal of water, her tree looked great.... I have a large back yard and think my tree eventually will be a 'conversation piece'. DirtyWork, Thank you and thanks so much for stopping by. Great lens! My neighbor has one of these trees and I absolutely love it. Lindabug, Your welcome and thanks so much for stopping by and leaving a comment. 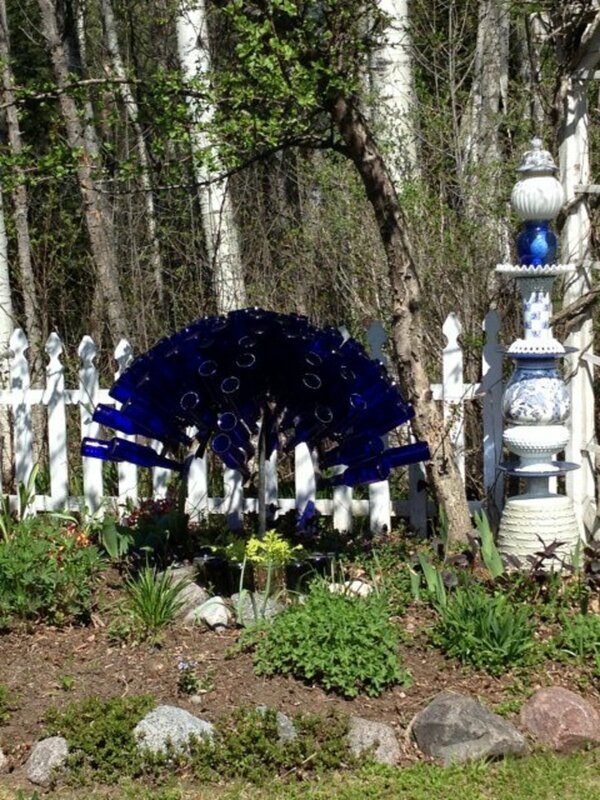 Raised in the South I have known about bottle trees for some time especially the blue ones. 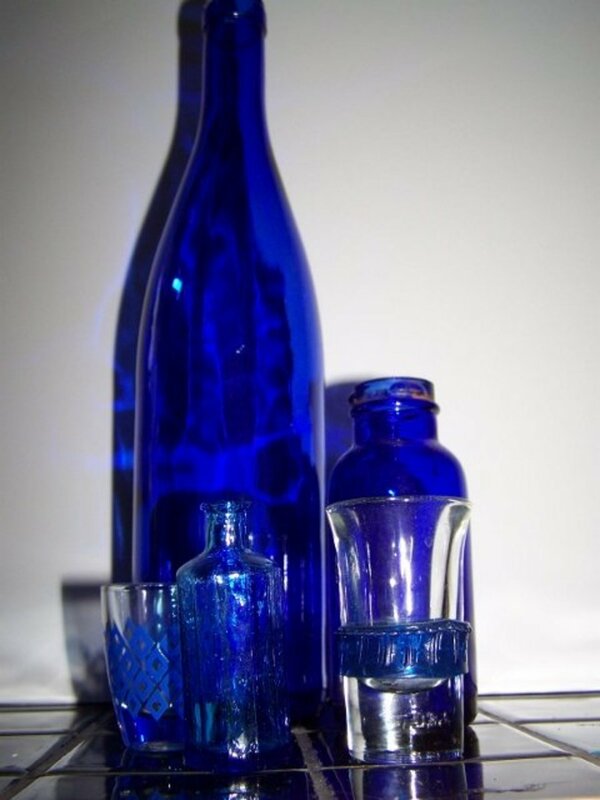 My husband has said he will make me one & we have been collecting bblue bottles. 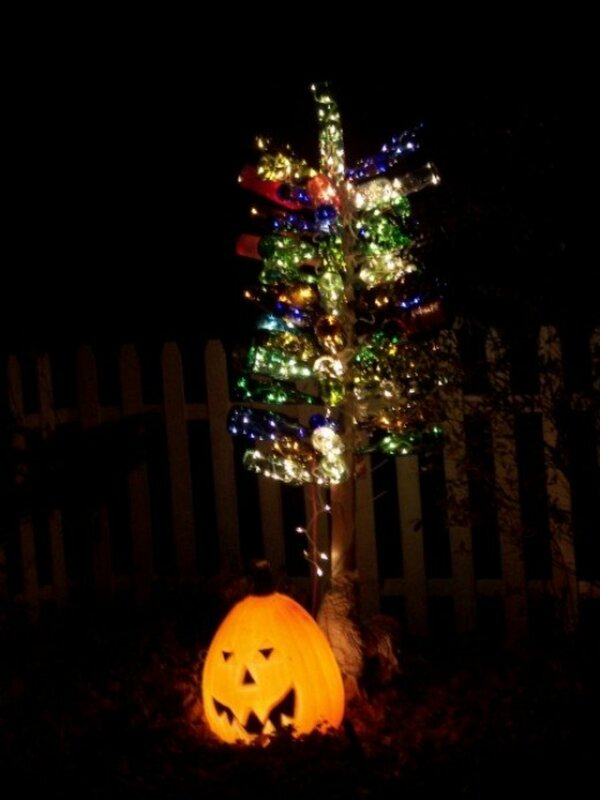 From the comments I just thought of the idea of a minature tree from a small black wire 'Halloween' tree & a group of small bottles I just bought at a yard sale. Can't wait to try that too. Thanks for your information. AliciaC, Your welcome glad you stopped by. This is a wonderful project, moonlake! The result is beautiful. Thank you for the instructions. Deborah-Diane, Thank you I appreciate that. I thougth I might get tired of this tree but I haven't yet. This is so adorable, I thought I would pin it to my "Crafts and Projects" board. I thought other people would like to try it, too! earnforlife, Your welcome and thanks for stopping by. erinshelby, Thank you and thanks for stopping by. Totally beautiful. Never thought of using junk in my garden before, but this looks so much better than it sounds. I see that the bottles and plants blend together really well. Thanks for the inspiration. This is really fascinating. What a neat way to make your own Christmas tree. Jackie Lynnley, Thank you for stopping by I appreciate it. Indian Chef, Thank you and thanks for share, vote and twitter I appreciate it. Very beautiful pics, sharing on twitter as there is no share with followers button on this page today and voting up. Toytasting, Thank you and thanks so much for stopping by. 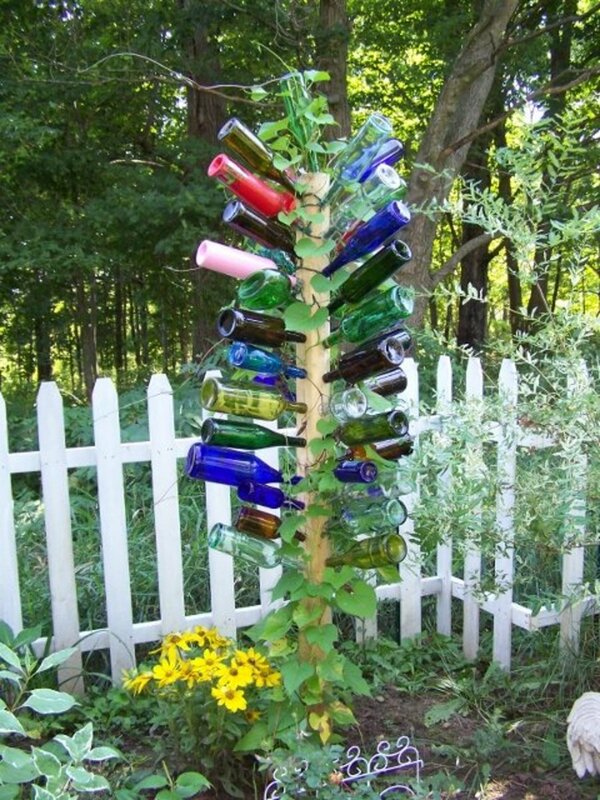 Kids would love making a bottle tree. Awesome! Awesome!AWESOME! I love the pictures, they are simply beautiful. This reminds me of the small bottle tree I made with my sister a few years ago. It was much less attractive though. I am inspired to make one again. I guess I will make one bottle tree in my farmhouse. This is the perfect time as we have vacations here in Mumbai. Kids are going to love it. Thank you for sharing this. FlourishAnyway, Thank you and thank for stopping by. Very neat frugal yard art! Love it. mailxpress, Thanks so much for stopping by and leaving a comment. I've never heard of such a thing. Interesting and the last video with the Route 66 garden was very good. Fun old man. Grace-Wolf-30, Thank you for stopping by I appreciate it. Wow, I've never heard of bottle trees before. Very beautiful and artistic. Might have a go at one myself. Thank you for the idea. Great hub! orddraven2000, Thank you for stopping by I appreciate it. Very cool way to recycle bottles. I had never even thought of this and at first I was very afraid it would look hockey but these are beautiful pieces of art. Thanks for sharing. Helen, Thanks so much for stopping by and leaving a comment. I love this tree so neat. I think I will put one in my garden. I have plenty of bottles for it. Divs001, Thank you and thanks so much for stopping by. I love looking at my bottle tree in my garden. I like it when the flowers grow up around it. twig22bend, Your welcome. I have drove all over this town trying to find a bottle tree everyone says they see but so far I have not found it. They can never remember the street. I appreciate you stopping by. How interesting. 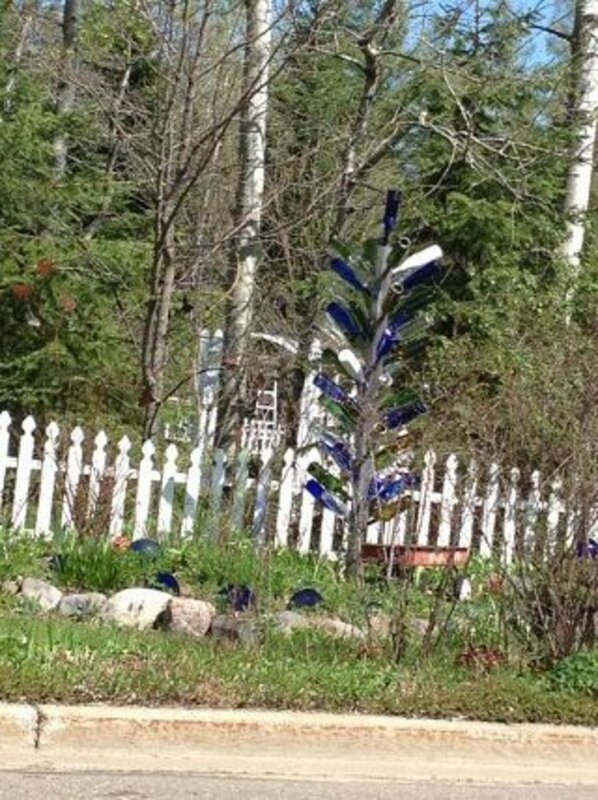 Just the other day I saw a bottle tree in someone's yard. I had no clue as to what it was. Thanks to you, now I know. I think that I might try to make one. I like the red and blue bottles. Thanks for sharing. Deborah-Diane, Thank you for stopping by. I'm waiting for the snow to go away and I will be adding more bottles to my tree. Where have I been? I had never even heard of a bottle tree until I read this. A very cool idea! I love the pictures you used, too. travel_man1971, Your welcome so glad you stopped by. I appreciate your comment. Awesome! We usually sell our old bottle at the junk stores. I might as well design my own bottle trees in the future. Thank you for sharing such idea. beingwell, Thanks for stopping by and I appreciate the vote. Haint trees, huh? They're nice and colorful trees! A good way to use old bottles, too. Voted up! shai77, Thank you and thanks so much for stopping by. I appreciate the votes. PaoloJpm, Thank you and thanks so much for stopping by and leaving a comment. 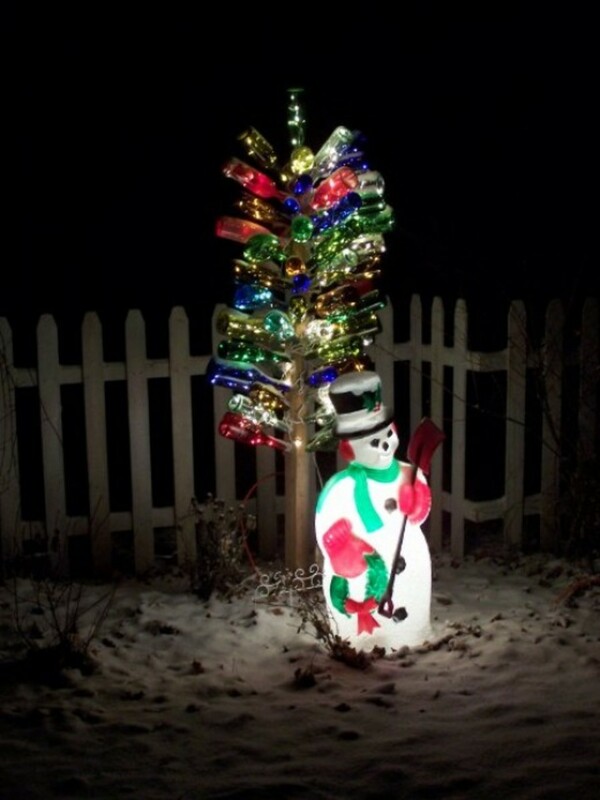 What a great way to recycle... that looks so cute, especially at night. All those green sprite bottles would look really good in there for a holiday tree. I love seeing creative art with recyclable materials, voted up! Great hub! Great photos! Great hub! so beautiful hope I can make one myself. people need to do things like this not only for recreational but environmental friendly. Barbara Kay, I have had to ask all around to get my bottles but when people know I need them they will usually save bottles. Thanks for stopping by and leaving a comment. 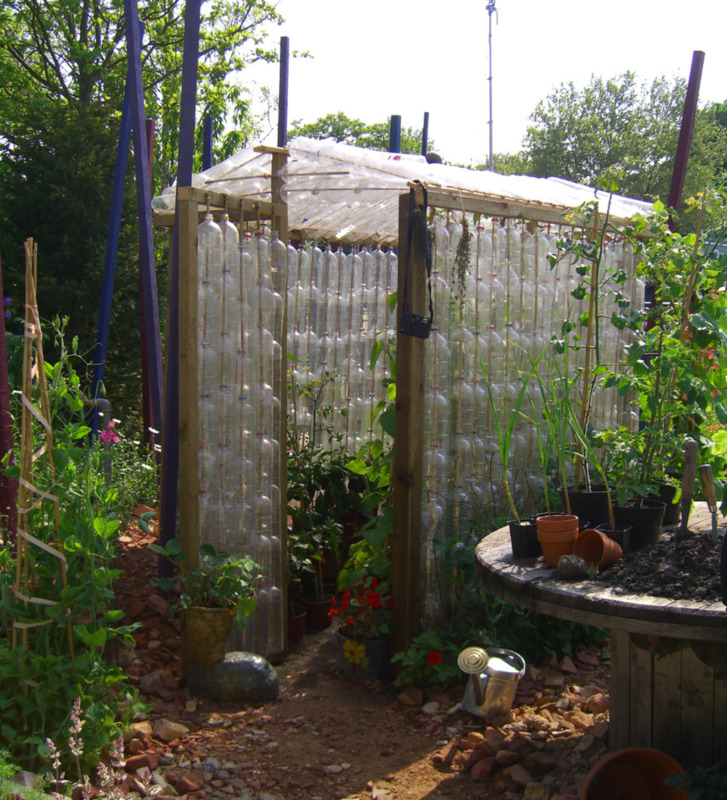 moonlake, My neighbor created one of these with blue bottles. One of our other neighbors saved them for her. It took her quite a while to get enough of them. Great idea! jayshreepattanaik, Thank you I appreciate your comment and the fact that you stopped by my hub so nice of you. MeltedGumby, That sounds interesting. Thanks so much for stopping by and leaving a comment. Very interesting idea! There's a guy who has a huge property in my town who does all his property up like this, and hosts big musical events and things. Love it! unknown spy, Thank you and thanks for stopping by and leaving a comment. I appreciate it. Wow, the tree bottle is really wonderful! not to mention the creativity for creating such thing. i love it! almenda, Thanks so much for stopping by and leaving a comment. I appreciate it. Thanks to you Moon for sharing this creative Idea with us. Jmillis2006, Bottle trees are more popular in the south than they are here. People stop on the road and look at mine. Thanks so much for stopping by and leaving a comment. Elias Zanetti, Thank you for dropping in I appreciate all the votes. I think on the internet I have seen bottle trees in the house as Christmas trees. almenda, Thank you and thanks for stopping by and leaving a comment. I seen one of these bottle trees when I was in GA visiting family over thanksgiving and thought it was really neat, even though at the time I had no clue what it was. Thank you for such an informative hub. What a marvelous idea, Moonlake! Now I know what kind of tree I'll have for Christmas from now onward! Thank you! I had no idea about the bottle trees and now, thanks to your hub, I got to know all about it! Also, congratulations for the wonderful tree you built! It's great! Voted up, awesome, interesting&useful! Cheers! Excellent thinking and creative mind. The bottle trees are looking very beautiful and it is a good use of useless bottles that we thrown in the garbage. Thundermama, Thank you for stopping by. I really enjoy my bottle tree. It's a fun thing to have in the garden. Thanks for the vote and sharing. Love this idea, especially the one with fairy lights in it. Such a lovely way to pretty up a garden. Can't wait to try it. Voted way up and sharing! newusedcarssacram, Thank you for stopping by and leaving a comment. I appreciate your visit. It looks even better when we put lights in them. This is so simple yet so beautiful. Diana Lee thank you for stopping I appreciate your visit. This is very interesting. I've seen many bottle trees, but never knew they were to ward off evil. celeste inscribed, Thanks so much for stopping by I appreciate it. How beautiful!! I think my favorite is the video of the 'School of blue bottle noses', but a close second is Elmer. loveofnight, Thanks so much for stopping in and leaving a comment. A very good read, I didn't know about the witch-ball or the hanging jar. Thanks for the info. lesliebyars, Thank you glad you enjoyed it. We get people driving by and checking out our bottle tree. They even pull down into our drive-way. There aren't many bottle trees around here. Thanks so much for stopping by and for the vote. This is so interesting. There are interesting bottle trees here in the Birmingham, AL. There's even a restaurant called The Bottle Tree. Voted up and interesting. Bobber, Thanks for stopping by and leaving a comment. I will have to check out the Moscato Di Asti. I'm starting to run out of room on my tree but we're going to try and move bottles around and add more in between. My aunt had her tree made from rerod. Just made our own bottle tree out of rerod. Easy to weld and bend. Bevlamo also makes a great Moscato Di Asti (Sams Club) which comes in a cobalt blue bottle. 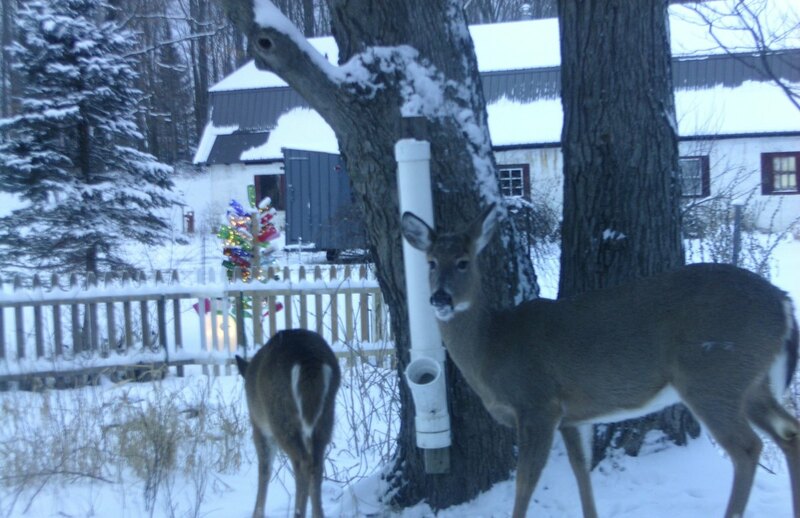 pstraubie48, Thank you so much for stopping by and leaving a comment. I was out in the snow tonight getting a picture of the bottle tree while it's snowing. It looks like a Christmas tree. Merry Christmas to you. raincitygirl, Thank you and thanks for stopping by and leaving a comment. I appreciate it. tattuwurn, I will be putting it on with a Christmas snowman in front of it. So nice you dropped by and left a comment. Blond Logic, I really enjoy mine. Thanks so much for stopping by and leaving a comment. I had never seen or heard of a bottle tree before. What a wonderful example of what to do with empty bottles. Beautiful and colorful. Magdaleine, Thank you and thank you for stopping by and leaving a comment. Interesting and beautiful, especially the one with light.